A page from the book Apples and Honey, edited by Nina Salaman, published in Great Britain in 1922. Several years ago, I was perusing an antique store in the historic river town of Stillwater, Minnesota. A small green book caught my eye, due to its conspicuously Jewish title: Apples and Honey. It was a collection of short stories, poems, passages of Scripture, biographies, and other writings, compiled for Jewish teenagers. It was published in Great Britain in 1922. It contained a smattering of Jewish topics, including aspirations of a Jewish homeland and struggles with anti-Semitic persecution. 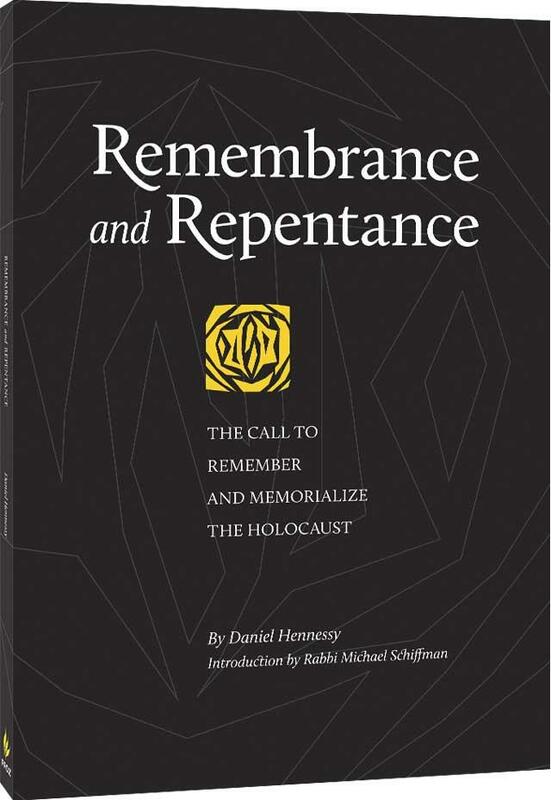 The stories about anti-Semitism were particularly interesting, because this book was written well before anyone could ever have imagined the Holocaust. When people address the topic of anti-Semitism today, the conversation is often overshadowed by the Shoah. I was intrigued to read a description of the experience of anti-Semitic persecution in Europe prior to the World War II Era. 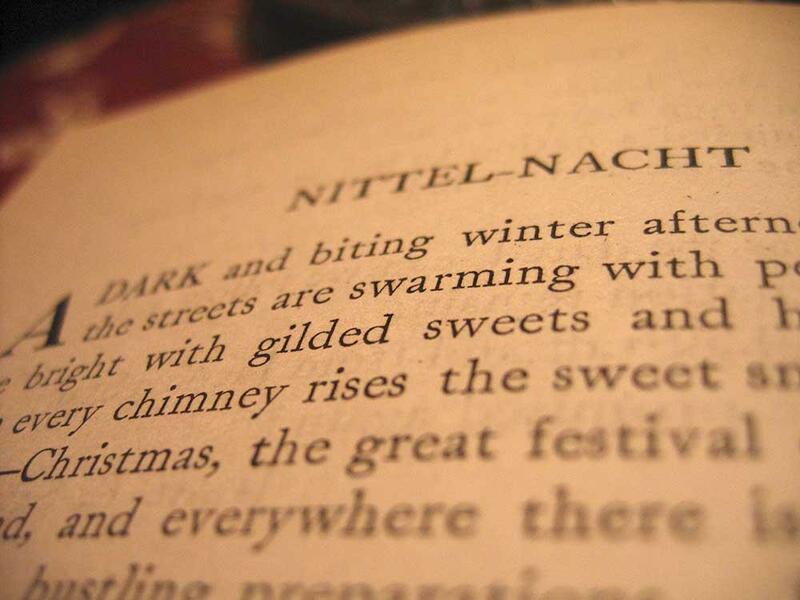 One story in the book was “Nittel Nacht” by Martha Wolfenstein, originally published in 1905. It takes place in the Judengasse (Jewish quarter) of an unnamed city in an Eastern European country, possibly Galicia or Bohemia. Although it is fiction, it is a fair depiction of Jewish life in that part of the world. Hirshl was a little, thin boy with a soft child’s face, out of which shone strangely wide, dark, half-shrewd, half-melancholy eyes. 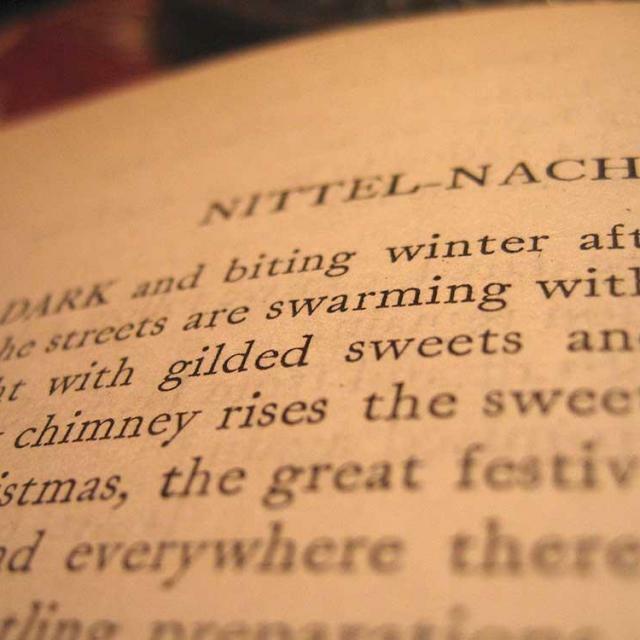 He knew that his errand was not void of dangers; for Christmas Eve, Nittel-Nacht, as it was called, has always been a favourite time for Jew raids, when the people fresh from church, where the priests had fired them with religious zeal, delighted in plundering and murdering the Jews in the name of Christ, their Lord. He knew that his father and the other men in the Gass always remained awake on this night, that they might be prepared in case of danger; but he also knew all the good hiding-places, all the dark windings and alley-ways of the town. So, grasping his basket firmly, he set out upon his errand. Google has now digitized this book and you can read the short story online. I highly recommend it. Given that Christmas Eve was a favorite time for raids, pogroms, and marauding, certain practices developed in Jewish communities as a result. Some of them were pragmatic, a matter of survival; others were symbolic, to show disdain for the enemies of the Jewish people. Most Christians today would never approve of violence toward Jews in the name of Jesus. Christians are typically quick to dismiss that type of activity as sinful and unbiblical. When confronted with historical anti-Semitism in the church, a common response is, “Those aren’t real Christians.” I understand and appreciate this sentiment, because it expresses the truth that such behavior and attitudes are not compatible with the teachings of Jesus. On the other hand, I find this response to be inadequate. Informally excommunicating those individuals and groups from one’s own personal definition of Christianity is passing the buck. It is a way to alleviate the “true” Christians of the responsibility for those attitudes and deeds. A better response is to accept that many acts of hate have occurred in the name of Christianity, and that Christianity institutionally bears guilt for them and must make amends. Those “Christians” have indelibly tarnished the reputation of Jesus; all of his followers, including Messianic Jews, pay the price for it. Anti-Semitism in the Church is something that Christianity in the Western world has mostly forgotten. Jews, however, have not forgotten it. It is a very real and core part of Jewish identity. Forgetfulness or denial of the breadth and scope of Christian anti-Semitism is one of the major reasons that Christians have such a hard time understanding Jews (and particularly their reaction to Christianity). But if Christianity accepts the blame for historical anti-Semitism, then what? Commence groveling, apologizing, and setting up monuments? No—the correct response is ideological introspection. In particular, Christianity must correct its erroneous view of the conflict in the Gospels between Jesus and his Jewish contemporaries. Jesus was a faithful Jew. The dispute that occurs in the Gospels is not Christianity versus Judaism. Jesus taught in keeping with Jewish values, confronting an error inherent in human nature: lack of love and proper concern for human well-being. He did not come to challenge or overthrow Jewish religious authority structures, laws, or ceremonial practices. Nor did he attempt to form a new religion or chosen people. The realization that Jesus fit squarely into Judaism should cause Christians to re-evaluate their own beliefs and practices, to respect Judaism as a religion and a move of God (even if one does not agree with all of Judaism’s religious beliefs), and to esteem the Jewish people as still having a chosen status as the core of the people of God. Furthermore, as Jesus has been horribly misrepresented as a brutal persecutor of Jewish people, this realization should cause Christians to be concerned with repairing his tarnished reputation. So what are these Chasidic customs? The most common is refraining from Torah study on that night. This is a traditional sign of mourning in Judaism, but the custom probably began to prevent people from venturing out to the study hall after dark. Another custom is to remain awake all night, playing cards to keep from falling asleep. Anti-Semitic acts by Christians are rare today. Nonetheless, it is wise for all Christians to be aware that their spiritual heritage includes anti-Semitic persecution, and to re-examine their own theology, words, culture, and political inclinations in light of that fact. I hope that as more people learn about the true identity of Yeshua of Nazareth, a Jew who remained devoted to his brothers and to the Torah of Moses, hatred for his people will completely vanish. Christian anti-Semitism built the road that led to Auschwitz. In the Holocaust, two thousand years of anti-Jewish replacement theology culminated in genocide. European Christianity sat as if bewitched in the cold darkness of indifference. This book is about remembering what happened in the past and learning from the mistakes to change the future. Available in eBook and Softcover editions.